I, Hildegarde, humbly request that you do not assume me to be an expert on this topic. I have webbed this page merely to make available material on the topic of Embroidery in the Medieval and Renaissance period. There are also some links to modern embroidery pages. If it doesn't appear within these pages, I probably don't know the answer... this is more a work of collecting other people's knowledge than of disseminating my own. I put this together in the early days of the World Wide Web, starting with some designs by Master Richard Wymarc that were otherwise only available on Compuserve. I wrote to him for permission to web those designs, and he gave it. To this, inspired by Stefan's Florilegium (which isn't what it was called in those days), I sorted and collected some messages from discussions on various mailing lists that I thought should be preserved for their helpfulness. The copyrights belong to those authors. Today, this site is rather quaint, but in its defense, it was the only site on this topic available for quite some time. It has been quite a while since I've actively maintained this set of pages, other than to periodically check for broken links. However, since this site HAS been on the web so long, it generally shows up at the top of the list of sites returned by search engines when someone searches for "Medieval Embroidery". 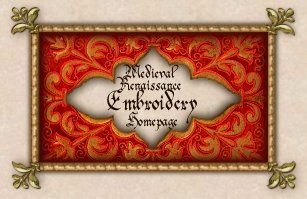 I would recommend going to Master Richard Wymarc's site, or to Clare's Medieval and Renaisssance Embroidery Page for a more actively updated site on this topic. I've been known to be lousy at responding to email in a timely fashion, and I'm actually not the most knowledgeable person on this topic around, so if you have a question about historical needlework, I highly recommend posing it to the experts on the H-Needlework mailing list. Image Source: Jost Amman and Hans Sachs, The Book of Trades (Standebuch), 1568. Image Source: Cosimo Tura and Francesco Cossa, The Triumph of Minerva, frescoes c. 1470. Blackwork, Assisi Work, and some answers to that perennial question: "Is Cross Stitch Period?" This piece, measuring 221 feet long and between 18 and 21 inches wide is, of course, actually not a woven tapestry, but an embroidery. It was done in colored wools on a linen ground. The stitching is laid and couched work in the solid shapes, with details in stem stitch. This piece was done between 1066 and 1082, and was probably commissioned by Bishop Odo of Bayeux. For a long time, this page had a link to a page put up by Gwydion ap Myrddin (Matt Stum), but this link now appears to be dead (http://blah.bsuvc.bsu.edu/bt). Copes, Altar Frontals, Dalmatics, etc. Copyright © 1994-1999 Joan Schraith Cole.